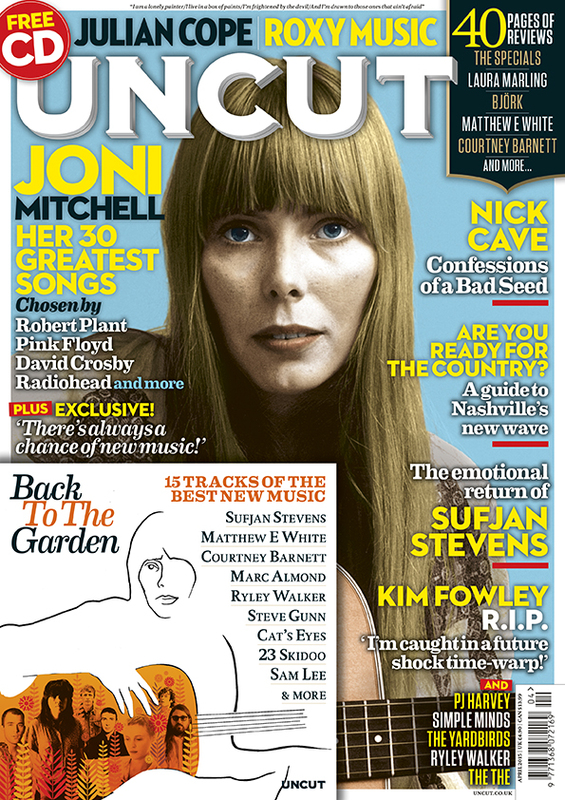 Joni Mitchell, Nick Cave, Sufjan Stevens and PJ Harvey all feature in the new issue of Uncut, dated April 2015 and out now. The incredible Joni Mitchell is on the cover, and inside, famous fans including Robert Plant, David Crosby and members of Radiohead and Pink Floyd pick the singer-songwriter’s 30 greatest songs. Close friends and collaborators also choose their favourites, with recollections of Mitchell provided by Graham Nash, the Incredible String Band’s Mike Heron, Linda Thompson, Joe Boyd, members of LA Express, and Alberta Ballet’s artistic director Jean Grand-Maitre, who worked closely with the singer on 2007’s The Fiddle And The Drum ballet. “I don’t think there’s a singer-songwriter in the world that hasn’t been affected by Joni,” David Crosby explains. Elsewhere, Warren Ellis provides the inside story of life in the Bad Seeds, describing the way Nick Cave and the group go about their work. Scary silences, boils, Australian Goths and, of course, the evolving work of this enduring musical force, are included. Uncut also heads to New York City to meet Sufjan Stevens and hear all about the musical polymath’s hushed, delicate new album, Carrie & Lowell, while editor John Mulvey reports from PJ Harvey’s pioneering Recording In Progress project, where fans can watch her working on a new album. Also in the issue, Phil Manzanera answers your questions about Roxy Music, David Gilmour’s new solo album and his work with Nico, David Bowie, John Cale and Robert Wyatt. Uncut meets a young breed of country artists, including Kacey Musgraves, Brandy Clark and Angaleena Presley, emerging from the US, positioned between the grit of Americana and mainstream glitz. “Go out on a limb. That’s where the fruit is,” we are told. We also salute the late legend Kim Fowley, auteur, producer, Svengali and provocateur, with a hair-raising 1972 interview from the Melody Maker archives; meanwhile, Simple Minds’ Jim Kerr takes us through the records that informed his adolescence in this month’s My Life In Music piece. Our ‘album by album’ feature this month comes from Matt Johnson, who guides us through his catalogue with The The and solo, while we also hear from The Dave Clark Five on how they created their transatlantic chart-topper “Glad All Over” and became the first British Invasion band to tour America. Uncut’s 40-page reviews section looks at new releases from Laura Marling, Björk, Ryley Walker, Courtney Barnett and more, while we assess archive releases from The Specials, Bob Marley, Roxy Music and more. Live, we catch Julian Cope on typically entertaining form in London, and Lambchop recreating their masterpiece, Nixon, in Berlin. Kim Gordon’s memoir, Girl In A Band, and a new biography of Sandy Denny feature on our books page, while we look at films including Altman, Michael Winterbottom’s The Face Of An Angel and a new Joe Strummer documentary. And finally, our free CD, Back To The Garden, includes songs by Sufjan Stevens, Matthew E White, Courtney Barnett, Marc Almond, Ryley Walker, Steve Gunn, Cat’s Eyes, Sam Lee and more. The new Uncut is out now.